When we choose a new product, such as a new floor, most of us like to know that it is going to stay looking good long after it has been fitted. When it comes to carpets they can be protected from dirt and stains before they are even installed. Some suppliers now offer an effective stain protection service at the point of order, removing the need to apply an additional product after installation. One particular product that has been developed for commercial use in hotels and airlines, and is therefore giving your carpet the maximum level of protection possible, is Intec. Intec is an effective way to protect carpets and fabrics from both dirt and stains. It has an innovative resinous formula that forms an invisible shield around every fibre. This means that the carpet keeps its look and feel whilst also making it easier to clean and care for. It is extremely durable and gives lasting protection even in the most demanding conditions. Anti-static agents prevent attraction of dry soils ensuring quick effective everyday cleaning. Spills are simply mopped up by absorbent paper or a clean towel – even dried in stains are easy to remove. Since, Intec does not alter the fibres’ colour, texture or flame retardancy even the most delicate silks can be treated with confidence. It has been designed to be environmentally friendly and is therefore water based and does not contain harmful solvents. As a result it is also a useful treatment for natural flooring such as jute, sisal and coir. By nature, natural floorings are more absorbent than their traditional counterparts and hence benefit greatly from additional protection. 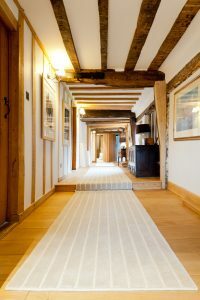 So no matter whether your preference is for wool, silk, bamboo or seagrass you can rest easy knowing that your carpet has been treated to withstand any normal household wear and tear, with the added peace of mind that any spills and stains that occur will be much more easily removed.